A weekly pill dispenser with a unique, patented system for opening the box and dispensing medication. 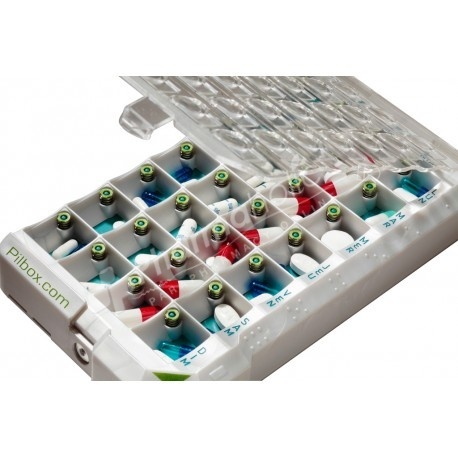 Quickly filled in one go, the Pilbox Classic delivers medication with each press. An effective help for patients to organise their treatment! For people taking multiple medications and having difficulties in coordinating their hand movements. Patented press-button system: delivers medication with each press. 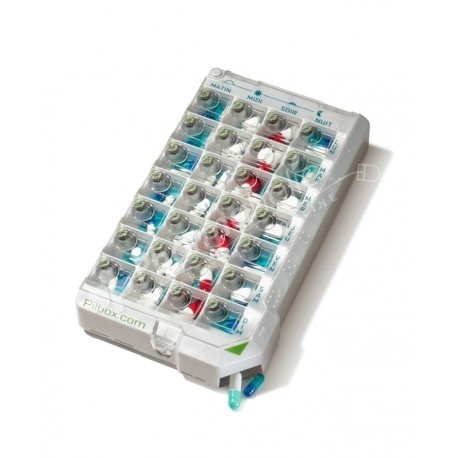 Fully opening lid that provides access to all compartments, so the pill dispenser can quickly be filled in one go. 28 compartments to organise your weekly treatment. 4 compartments a day (morning, noon, evening and night). Each compartment can contain up to 5 standard-size capsules. Fully opening transparent lid: easy to refill all of the compartments in one go. Easy to check your week's treatment in a single glance and to know whether or not you have taken your medication. Sensory and visual markers to indicate each dose. A chart for your important medical information.